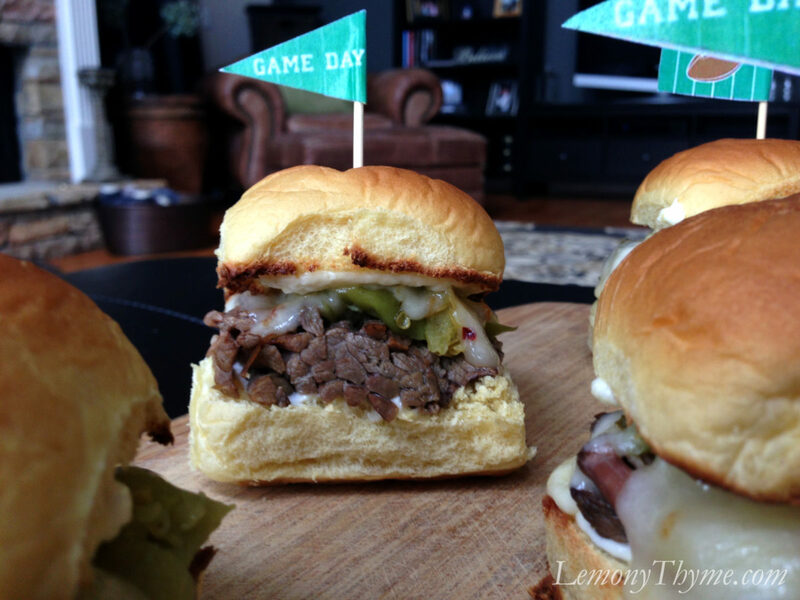 Pepperoncini Beef Sliders with Pepper Jack Cheese. Game Changer. Begin with a Pepperoncini Beef Pot Roast recipe. Shred beef with forks and slice pepperoncini. 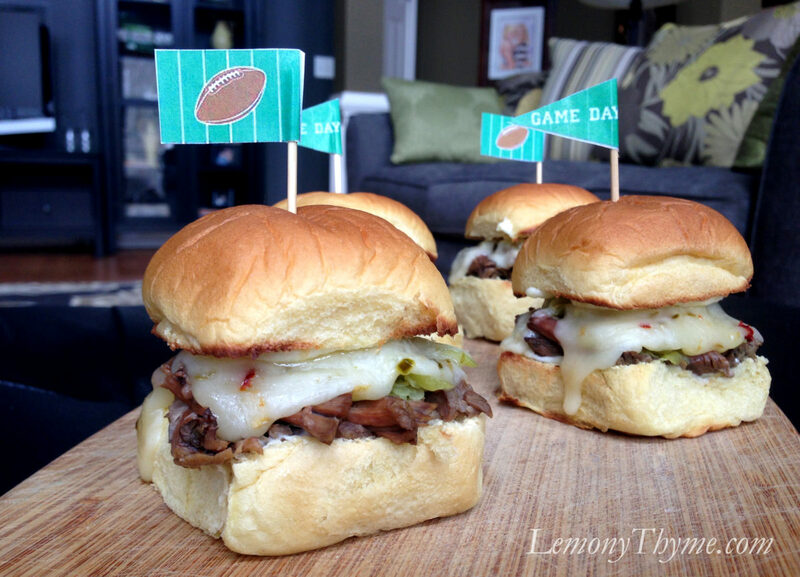 To serve, pile beef & peppers on bottom half of slider buns, top with pepper jack cheese, quick trip under the broiler, replace top of bun, ladle a spoonful of the cooking liquid into a side dish for dipping, pour glass of ice cold beer, assume the position in your favorite chair squarely in front of the TV, just in time for GAME TIME!! Place chuck roast in your slow cooker, sprinkle on garlic powder, salt & pepper, pour in jar of pepperoncini. Set to low and cook for 8-10 hours. Shred beef with forks and slice pepperoncini. Stir together mayonnaise and cream cheese. 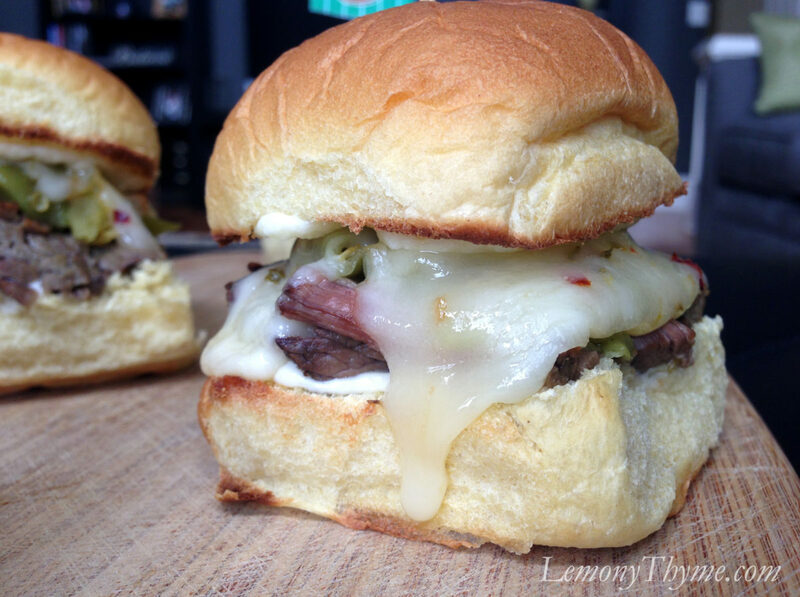 To serve, pile beef & peppers on bottom half of slider buns, top with pepper jack cheese. Spread a spoonful of mayonnaise mixture on top half of bun. Quick trip under the broiler until cheese has melted. Replace top of bun, ladle a spoonful of the cooking liquid into a side dish for dipping. This looks awesome and I am going to try this version soon! My version (very old recipe) uses Chuck Roast, sliced onions, beef stock, 1 pkg of dry good seasons italian dressing, 1/2 jar of Pepperonini’s + 14 c. juice, and 1 whole can of beer (I just use Bed Select bc that’s what we had). Bake at 350 for 3 hours and check for tenderness (if not, cut in big chunks) and bake another 30-45 min. Serve on broiled Ital. bread. It is outstanding! !